a) Candidate enters the Centre. b) Candidate goes through the Seating Plan displayed at the entrance and identifies the specific Examination Hall allocated to him/her. c) After confirming the Examination Hall, the candidate is directed to proceed to the Registration Desk for giving photo and Thumb impression. d) If more than 100 systems are available in a Centre, then there will be two Registration Desks. 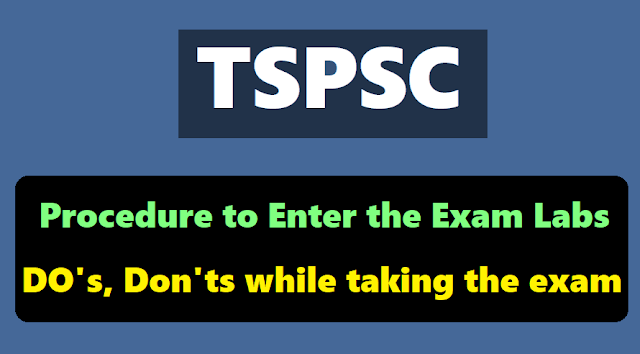 e) The candidate should carry ONLY the printout of the Admit Card downloaded from the TSPSC website along with any valid Identity proof in original. f) At the Registration Desk, the candidate shows his/her Admit Card and Identity Proof. g) The CBRT-P representative at the Registration Desk will verify the Admit Card and the Identity Proof, and checks the candidate’s name in the list provided. h) If everything is found to be in order, then the candidate proceeds to the Examination Hall. i) The candidate sits at the computer allotted to him/her and waits for further instructions from invigilators. Closure of Candidate entry into the Examination Centre is 9.15 AM/1.45 PM for FN/AN Sessions. Candidates has report to the test center before GATE closure time Candidate Has to Bring hall ticket for verification along with at least one original (no photocopy or scanned copy) valid identification card (for example: Passport, PAN Card, Voter ID, Aadhaar-UID, Government Employer ID and Driving License) to enter to examination Hall. The check-in procedure inside the test hall may include capturing your image and left thumbprint. This is a security feature which will allow TSPSC to verify your identity and also to check impersonation by any candidate. You have to use the mouse to answer the multiple choice type questions. Candidate has to sit for 150 mins of exam time. No candidate is allowed to leave the Examination hall till the end of the examination. Submit the Rough sheets & Pen to the invigilator before you leave the hall. Candidate Photo not appearing properly in Hall Ticket, such Candidates has to bring two passport size photographs. Candidates are advised not to Violate Instr uctions/misbehave during the examination. The system allotted to Candidate, displays your personal details (photo and name) on your login screen. Go through them carefully and contact the invigilators in case of any discrepancy. Candidates should not be late as they will not be allowed to test center after GATE Closure time. Candidates Without having Hall Ticket and Original Identification will not be allowed to the examination center. sheets or recording instruments strapped on your body or in your pockets to exam room. Do not bring your valuable devices or personal belongings. There may not be a guaranteed security facility for safe-keeping of outside the examination hall. Candidates are advised not to apply any external matters like Mehandi, Ink etc. on their Hands/Foot. Because of this your Thumb impression/biometric may not be captured at examination center. Do not touch the Key board during the exam. Candidate are advised to sit on the system allotted to them as per the system numbers given at the examination hall.